Thanks for stopping by my blog & leaving a comment. What you were looking at is an aceo.For those not familiar with them, ACEO stands for artist cards, editions and originals. They are small works of art in any media, the only criteria being they measure 2 1/2" x 3 1/2". I did this one as a challenge to use the color red. Your bag stitch pattern is amazing! God, I love you!!! I saw this stitch somewhere, and didn't know how to figure it out!!! :D You are the best!!! Thanks again for your comments. I mostly taught myself to do everything. I was always very crafty even as a child. I always enjoyed drawing and making things. I do not find you too curious at all--I enjoy "meeting" people and am happy to blog with you. Congratulations! 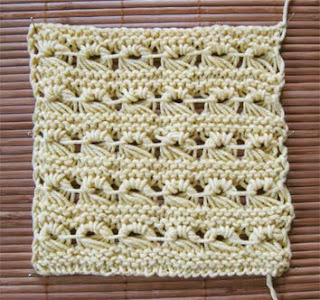 What a lovely stitch pattern! Felicitari pentru blog si calde salutari din Bucuresti!